As with other Arsenal in the summer articles, rather than stick to the exact chronology of events I am going to work through a few themes and stories, which will bend the chronology slightly. And to begin this Arsenal in the summer meander I’ll consider the tale of Jock Rutherford’s summer. By March 1923 Jock Rutherford had played over 170 games for Arsenal with much distinction, and he was considering his future, now being 39 years old. It is reported that one area of work that he fancied was club management. This story seems to have got around – I think it was in an newspaper interview, although I can’t find the article to confirm this – and Rutherford was approached by Stoke City to be their manager. Jock was a well-known player, having played 11 times for England by this time, and he was clearly interested, despite Stoke’s lowly place in the league… by mid-March their situation was poor but not impossible. The information available about what happened next is contradictory and some of it is just plain wrong. For example Wikipedia has Jock managing Stoke at the end of the season for 11 games of which two were won. Which is slightly odd since Jock was a regular in the Arsenal first team all the way through March up to and including the game on 2 April against Blackburn. Was he really managing while playing for Arsenal? It seems unlikely. And if he was, what could he have done? So if he did transfer it would have been just for the last five games of the season, giving him a record of two wins, one draw and one defeat. Not bad for a sinking club. Too late to save them, but showing good promise especially in the light of what had come before. Although Stoke were founder members of the Football League they had had a very rough ride, dropping out of the League and going down not just into the Southern League but the western division of Southern League 2 at one point. 1922/3 was their first year in the Football League since 1907, and as the table shows, they had had a tough time. So when as (for example) the article in Wikipedia says he was being offered the “reigns of a First Division club, but then found the situation was far worse than he thought, when he arrived,” this seems very unlikely. The club had no long term 1st division pedigree and had overachieved to get this one year in the top flight. It is also said that even when the inevitable relegation was confirmed there was hope that under Rutherford the club could jump straight back up. But again, that seems unlikely, for Stoke had never finished higher than 9th in the league, and had spent just about as long outside it, as in it. It is then said that Arsenal arranged a retirement party for Jock – which sounds right, for as we have seen, the club was very good at holding social events for players. It is suggested that two events followed. First the farewell party made Jock feel nostalgic, and second he was involved in a car accident and so was unable to return to Stoke for the start of the next season. I can’t confirm the car accident, but if Jock was unable to travel back in time for the opening match of the season on 25 August, it seems a miraculously quick recovery to find him playing again for Arsenal on September 8 – just two weeks later. Jock might have been able to walk and travel by then, but from not being able to travel to being able to play in what were still very rough and tumble games of that era, seems unbelievable. Elsewhere it says Jock was in charge of Stoke for four weeks. But that is also very odd. For it is also written that Jock was signing on with Stoke as a player manager. Now if he did do that, he would have been tied to Stoke under the retain and transfer rules – he could not go and play for anyone else unless Stoke released him. A poor defeat to Leeds, but if it was him he could have said that a win and two draws out of four games was a lot better than the end of the previous season. But as it was Jock continued to play (albeit with one more interruption) for Arsenal until 20 March 1926 by which time he was 41 years and 159 days old – Arsenal’s oldest ever player. Overall the whole story looks like a mishmash of newspaper gossip. If he was manager for Stoke it was for a very short spell at the end of the 1922/23 season – nothing more. And what makes me even more dubious about the whole story is that we might think that after all that, Jock might have returned to his dream of management, but no, after a little while longer playing further down the leagues he left football and ran an off-licence. So whatever happened to Jock Rutherford he was by 1923/4 an Arsenal player again. And as we know, having been elected to the first division after coming 5th in the final pre-war season Arsenal had since come 10th, 9th, 17th and 11th – which on the face of it looked solidly mid-table. The only worrying factor is that in the last two seasons Arsenal had flirted seriously with relegation after poor starts to the season. For this reason I suspect whatever the story of Jock was, he was welcomed back to Arsenal with open arms. Meanwhile we also know that much of the money that Henry Norris had laid out to support the club’s move to Highbury and indeed the money that he had invested in the club in order to save it from going out of business in 1910, was gradually coming back to him, as loans were repaid, and some shares were sold. There were also other signs of growth and development. For example, on 17 March 1923 Bob John had made his international debut and interestingly, in an era when players often played no more than two or three times for their country, he went on to play for Wales 15 times between 1923 and 1937. On 14 April 1923: John “Alex” Mackie played his first international for Ireland at the age of just 20. Forever condemned to be known for the false story about demanding a monkey as a signing on fee he was actually very talented and played over 100 games for Arsenal. He had become the permanent full back on 9 December 1922, immediately setting up a long term partnership with Kennedy at left back. Curiously Andy Kennedy, was also was selected by Ireland for the first time in the same match on 14 April 1923. The result for the Arsenal duo was a triumph. Having lost both their other Championship matches, Ireland now beat Wales 0-3 in Wrexham. Now in the previous section of this history we have taken Arsenal through to the end of their season, but most clubs continued to play for one more week, with games scheduled for 5 May 1923. Arsenal didn’t have a first team match on this day but they did however have a reserve game against Brentford, and it was a match of some significance because on this day Arsenal were crowned the champions of the London Combination (the war time league that had become the reserve league for the capital from 1919 onwards). We now live in an era when 99% of supporters probably can’t tell you who won the under 23 league (the nearest thing we now have to a reserve league) this season, so it may seem strange to make much of this, but at a time before TV and with no football on the radio, the reserve matches got significant crowds and there was a lot of interest in the games. With matches played on Saturday at Highbury when Arsenal’s League team were away, the reserves matches meant that supporters could go to the ground every Saturday for a match. Indeed reading such commentaries as there are, it seems that the regular players in the Combination team were very proud of their position, and the reserve team manager could be rather miffed at times to find he lost a player to the first team squad when there was an important Combination match to be played at the same time. As you can see each team played the others four times in the season, with all the games taking place in London, which also helped the crowds and reduced the clubs’ costs. I have struggled to find any information about the attendance figures at Highbury for the reserve games but I believe that as late as the 1950s (when of course broadcasting of football was still virtually non-existent in England) reserve games would regularly get crowds of 10,000. It is possible that this season the attendance figures were considerably higher. Sally Davis reports that by the date of this Combination game Sir Henry Norris and his family were already in France in their recently built new home in Villefranche which was part of his recuperation from the illnesses he had suffered in recent years. In Division One, Stoke City (the club I suspect Jock Rutherford did not manage) were relegated as expected. Notts County and West Ham were promoted; West Ham in particular had had a brilliant season even though they lost the FA Cup in the end. Arsenal had finished mid-table as we have seen, but the early part of the season had been a scare, and so Knighton needed to strengthen the squad. And indeed the next transfer was another important one – perhaps second only to signing Bob John, for on 8 May 1923 Jimmy Brain transferred from Ton Pentre to Arsenal. In the years to come Brain scored 125 goals in 204 games for Arsenal. And it is perhaps interesting to ponder here Knighton’s tales of woe about not signing top players. 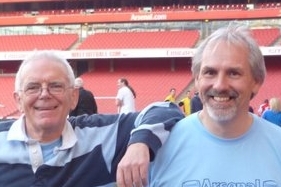 Maybe there were limits on the amount that could be spent, as Arsenal were still repaying debts, but the arrival of the two full backs, and of Bob John an Jimmy Brain suggest that even if, as Knighton claimed, his wonderful network of scouts was wound up, somehow he was still finding the players. In fact we might conclude that his talent in finding players was not to be questioned. Where he was not very good was in playing them all the way through the season. Twice now Arsenal had had very poor openings to the campaign, but had come good in the end. For it to happen again would begin to cast doubt on Knighton’s ability. But let us not get too far ahead. At the end of the 1922/3 season Arsenal went on another foreign tour, as they had done at the end of the season before, and indeed as happened several times in the pre-war era, including for example the eight match tour in 1912. This time it was a seven match series starting on 10 May, 12 days after the end of the League season, with a game in Copenhagen against Boldklubben Frem, with Arsenal winning 4-2. This game saw the first appearance of Samson Haden who went on to play 88 times in the Football League for Arsenal before moving onto Notts County. The players employed were mostly from the first XI of the latter part of the season, although Dunn (who was now the reserve keeper) played in goal throughout. And there were some unfamiliar names including Moffatt (who was signed just before the tour) and Cockle. Moffatt played in all seven games and scored twice, and Cockle played in five of the games, but neither man ever turned out for the first team. Now according to Knighton in his autobiography, Sir Henry Norris banned him from employing players smaller than 5 foot 8 inches tall and so despite being an utterly brilliant player Midge Moffatt was not allowed to sign for Arsenal, and this, by implication is the reason that not everything went well next season. But history doesn’t support Knighton’s contention that the player was not good enough, because surely if Moffatt had been as good a player as all that he would have found another club. The only trace we have anywhere of a player called Moffatt in any league club is a Harold Moffat (note only one “t”) who was born in Camerton on January 1 1900 and who played twice for Everton in 1926/7. The great success of the tour was Turnbull, the left back turned centre forward who played in all seven games and scored 14 goals. Admittedly the opposition was not of the highest quality, but the goals still had to go in. He had scored 20 goals in 35 league games – of which eight were played at full back, during which he had not scored any goals (as one would expect). So effectively that was 20 goals in 27. A very solid return. Here are the tour details. I’m not sure if Arsenal’s new star keeper, Robson, was on the tour. You may recall he started the season as third choice, with Ernie Williamson as first choice. If he was there, he didn’t get a game – so maybe Arsenal took the gamble of taking only one keeper (perhaps with the agreement of the home clubs that they would lend their reserve keeper if Arsenal suddenly suffered an injury and couldn’t get the replacement out on time). Either way, Williamson was certainly not there because on 21 May 1923 he won the first of two caps in three days becoming Arsenal’s first post war England international. Also in the squad, although primarily there as a trainer,was Joe Shaw, and he did play in the game on 23 May 1923. Joe Shaw, as you may recall, was one of the most important men in Arsenal’s history, who was not only a stalwart and captain of Arsenal through the years of transformation from Woolwich Arsenal to Arsenal, he also went on to become a league winning manager on the death of Herbert Chapman. This was his final appearance. He was already manager of Arsenal Youth Team and later became the manager of Arsenal Reserves. He had played 309 league and 17 cup games for the club. 28 June 1923: Harry Woods joined Arsenal from Newcastle U. He served his country in the Tank Corps in France during the war, and then played for South Shields before moving to Newcastle United in January 1922 for £2600 – a fee that for a few months was the world record. He was now 33, but still a valuable player to have with the club and he went on to play 70 times scoring 21 goals before moving on to Luton Town. Three other players arrived at Arsenal in the summer who went on to play in the forthcoming season. Edward Wallington came on a free transfer for Watford. He was an outside right and played just once for Arsenal before leaving the club and playing as an amateur. Second we had James Ramsay. Arsenal have nothing on him on the official club site, but elsewhere I’ve discovered that he served his country with the 6th Seaforth Highlanders and was in France during the war. He came from Kilmarnock, to whom he returned after his time at Arsenal. He did not join until February 1924, for a fee of £1775 – yet another example of Knighton’s imaginary fee limitation being exceeded. He made his debut the following month against Liverpool. He played 11 games in the rest of the season, and stayed three more years, including two under Chapman to make a total of 69 appearances (plus six in the Cup) with 11 goals.scored. Ramsay left Arsenal to return to Kilmarnock in December 1926, then moved onto Galston and later came back to Arsenal to be manager of the nursery club Margate FC before leaving football in 1936. Finally we have Andrew Neill, who like Ramsay came to Arsenal late in the season when things were starting to look singularly desperate. He joined from Brighton & Hove Albion for £3,000 (yet another breaking of the £1000 limit!) This is, I know, getting a bit tedious recording all the transfers over £1000, but it is important since the £1000 limit is a central part of the Knighton thesis of the horrors of life under Knighton. He played 54 games and scored 10 goals for Arsenal. So in terms of Knighton we do have more examples that prove that the £1000 limit was a figment of his imagination, and the issue of the Midge M0ffatt who played through the tour, but of whom we have no record thereafter. My guess for what it is worth is (which is based on such evidence as there is) is that Moffatt was rejected by Sir Henry when Knighton proposed giving him a contract, quite possibly on the evidence of Joe Shaw and the directors who were on the tour. Knighton was miffed and so 20 years later, blamed Norris because it fitted in with his thesis, and excused himself. Had Moffatt made a name for himself elsewhere my thesis would fall, but two games for Everton a couple of years later suggest that if it was Sir Henry who refused to sanction the contract, he was right so to do. That ends the summer tour and the issue of Moffatt, so now I would like to change direction and look back to the attendances across the league. This table is based on data provided in different formats by European Football Statistics. We look here at the decline in league attendances after the resumption of football in 1919 and the level of Arsenal’s average crowd. Arsenal as we can see were never the best supported club in this period, but the gap between Arsenal’s average crowd and that of the best supported club was narrowing all the time reducing from around 7,000 a game to around 3,000 a game. *Arsenal were the eighth best supported club in the Football League, but were of course in the second division in this season. They were in fact the best supported Division 2 club. Finally in this section we can have a look at the players who played for Arsenal in this season with figures provided by 11v11 website. If the figures show us one particular problem for Arsenal it was with the goalscorer. Turnbull had 21 in 37, a superb achievement since, as we have noted initially he was not a centre forward. But what would happen if he were injured? But perhaps above all this summer shows us another Knighton fantasy. He had a player who he thought was good. He played him in all the pre-season matches. One way or another he wasn’t brought into the club, and the story emerged that Sir Henry Norris simply rejected all players under a specified height. Knighton would have a case if Moffatt had signed elsewhere for any League club at any level, but we have no record of him so doing. It looks very much like yet another piece of vindictive blame-games from Knighton, not least in trying to show that what happened in 1923/4 was not his fault.